Your description of this book is fascinating, but I think I would have to be in a fair invulnerable mood of equanimity to tackle it. Thanks, Lin. Yes, one of those books where you really do need to be sitting comfortably before you begin! Excellent find old chap, your cover shot is amazing – those creases and signs of age just add to the beauty of the book. Can’t beat a bit of Wheatley either! Keep ’em coming, all the best. Thanks, as always, for your comments. Yes, a bit of a creased and ragged edition, this one. I rescued it from a skip years ago; never ceases to amaze me how some people can just discard a book when they’ve finished reading it. A book is for life, not just for Christmas!! I’m definitely putting this on my to-read list. The only book I have by Endore is ‘Satan’s Saint’, a novel about the Marquis De Sade. I haven’t read it, but what a title! 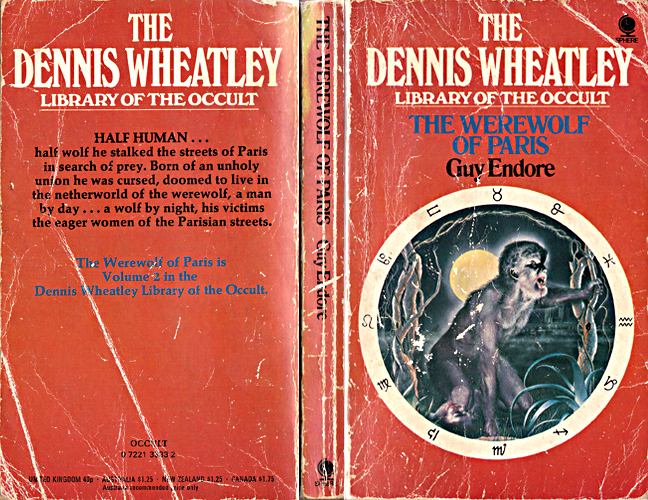 Werewolf of Paris is the only one of Endore’s I’ve read but I’d definitely read more on the back of it. ‘Satan’s Saint’ certainly sounds like a good place to continue!